Khaleed Khateeb dreamed of being a photojournalist when he was in high school. As he watched Syria crumble into chaos around him, he wanted to share his country's story with the world. "And now," he says, "I have finally got my dream." 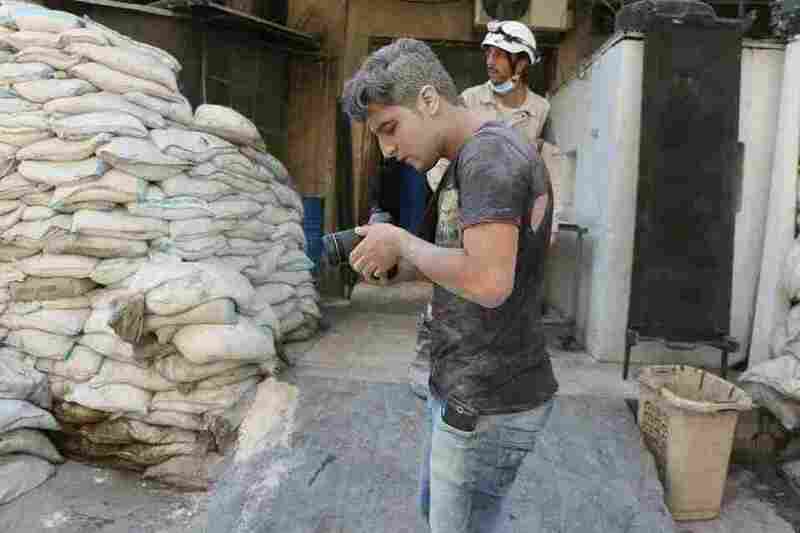 Khateeb is a 21-year-old volunteer for the Syria Civil Defense forces, rescuing those caught in the crossfire of the civil war. And over the past year, he has had a second job: filming his fellow volunteers' heroic efforts for the Netflix documentary The White Helmets, a 41-minute film released this month. Khateeb worked with U.K.-based filmmaker Orlando von Einsiedel, director of the Oscar-nominated 2014 film Virunga, about the gorillas who live in that Congolese national park. 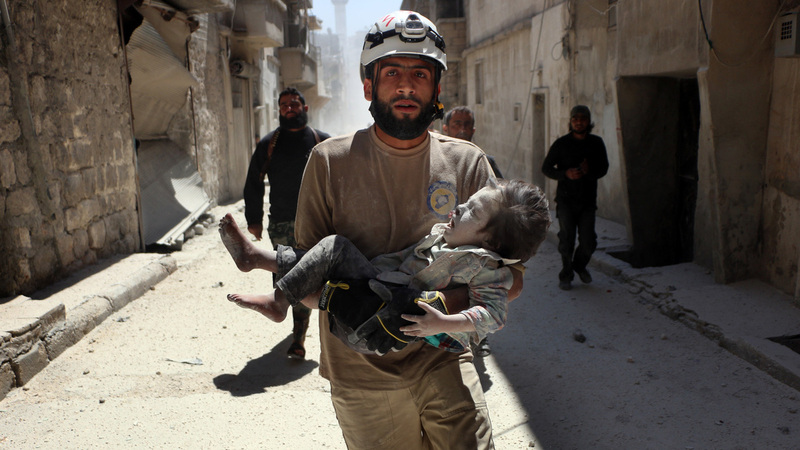 Von Einsiedel says he first found out about the Civil Defense forces — informally known as the White Helmets — when "some friends showed me and [producer Joanna Natasegara] this grainy YouTube footage of this tiny baby being pulled out from the rubble after a bombing." "We were even more moved when we found out who the rescuers were," von Einsiedel says — regular citizens. They're former blacksmiths and accountants, gym teachers and students — like Khateeb. In the five years since the civil war between President Bashar Assad's government and rebel groups began, more than 250,000 Syrians have died in the conflict. But thanks to the White Helmets, over 60,000 lives have been saved. The story, von Einsiedel says, was "one that reignited my faith in humanity." So von Einsiedel reached out to the nonprofit Mayday Rescue, which provides the White Helmets with equipment and guidance, to ask if he could join a group of volunteers in Turkey. They had come up from Aleppo for a boot camp in search-and-rescue techniques. The director wasn't sure how to get footage from Syria's front lines. "The risks to journalists in Syria at the moment are so high that for us to go there would have been frankly just reckless," von Einsiedel says. A White Helmets volunteer in Aleppo carries an injured child after an airstrike. That's when the filmmakers found out about Khateeb, who had been informally filming rescue missions and posting them on YouTube since he joined the White Helmets back in 2013. "When the Assad regime lost many areas inside Syria, I saw many photographers and reporters come in Syria, doing very important work, documenting," Khateeb says. "And I thought I wanted to be just like them." Von Einsiedel asked Khateeb to come meet him and the rest of the film crew at the training in Turkey and commissioned him to be a videographer. "We helped hone his documentary filming skills," von Einsiedel says. Khateeb went back to Aleppo with better camera equipment. Khateeb's footage offers a look into daily life for the White Helmets as they rush toward bomb blasts and dig through rubble, searching for life among a mess of dismembered bodies. He also captures the quieter moments in between rescue missions. One volunteer collapses in tears when he learns that his brother has been killed in a bombing, and another folds over with relief when he learns that his son has been spared. Khateeb himself has experienced considerable loss while working with the White Helmets. "The most difficult thing for us is losing another volunteer," he says. "In 2014, we lost three volunteers in one day. We were going to a rescue operation. When we arrived to the massacre, the aircraft targeted the same place again." Medical workers — as well as first responders, including the White Helmets — are especially at risk of being targeted by Assad's military, according to international aid groups. Over 130 White Helmets have died on duty since the group started in 2013. Khateeb says he plans to stay in Aleppo as the White Helmets' official chronicler, even though he understands the grave risks. He'd rather that his parents, who fled to Turkey, not know just how dangerous his job is. Recently, he texted them a nice picture of the swimming pool at the White Helmets headquarters. "I told them, you know, 'I'm bored and I'm just swimming,' " he says. "I sent them this because I want them to forget the bad images of Aleppo." And yet, he says, it's important that the rest of the world see those images. "So maybe they will exercise pressure on their government to intervene," he says. "Maybe then we can stop this genocide."